I know what you're thinking. I thought the same thing, too. I read a review of the Fig Rig a year or two ago in DV magazine or something. At the time, it seemed rather silly. 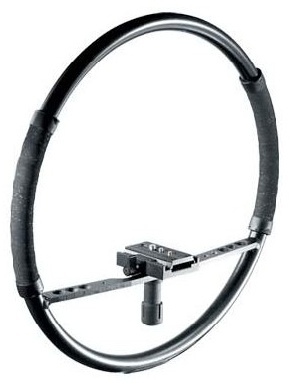 A steering wheel looking device with a bar across it for mounting your small camera. And a bunch of accessories for, well, accessorizing. "What's the big deal?" I thought. Here's the thing. As much as I hate to admit it, I really miss my nice, big, 16-pound shoulder-mount AJ-D700 DVC-Pro camera. It was a great camera. And while I think I may have permanent back damage from lugging it around, the thing was a breeze to shoot handheld with. It's weight and form factor, and the fact that it sat on my shoulder made it a cinch to get steady shots. Because I shot with it so much, I got quite good at bracing myself for handheld shots that rivaled being on sticks. But no more. Right now, all I have to shoot with is a GL-2; and while I appreciate the light weight, it's almost impossible to get a smooth handheld shot with it, even with the optical image stabilizer. The problem is physics. It's so light, it has no mass to stabilize it, and the form factor demands that you hold it out in front of you, which means you're relying on muscle power to hold it steady, not bones. And switching to a low angle shot requires a rather lengthy grip change over. Enter the Fig Rig. It looks like a steering wheel, and is about as big. As a camera support system, it's a model of simplicity—and this turns out to be a good thing. The wheel is padded at 3 and 9 (where you'd hold the wheel to "drive") and there's a bar with various holes—some tapped, others not—across the bottom to hold the camera, a monitor, mics, and whatever you can rig up to it. That's it. It's made from anodized aluminum and weights just a few pounds. Like I said, when I read about it, I thought, "Whatever, I still miss my 700." However, today I took it out on a shoot. What a difference! It is truly amazing how much easier it is to shoot with a small camera using the Fig Rig. For basic shots, that is at about eye level, you hold the rig in front of you, with your elbows braced against your sides. This is an inherently stable position. Try it—even without the rig, you can see how much more stable your hands are than if you have your right hand floating in the breeze as you would when holding a camcorder. If you need to walk and shoot, pull your elbows off your side, bend your knees and walk. It looks almost steadi-cam like. Perhaps not quite as fluid, but hey, we're talking just over $300, not $10,000. One cool trick is sitting down and resting the rig on your thighs. In that position, you can pan and tilt almost as smoothly as with a fluid head tripod, and with fewer constraints. You can also set it on any flat surface for horizontal support, and twist it to pan. Tilting is just as easy. The variety of shots you can pull off fluidly is quite amazing. Because I was shooting kids (OK, that sounds bad, I was filming children playing on the floor with adults...), I went for a bunch of low angle shots. I've not ever been able to get decent shots like this with the GL-2. There's simply not enough mass to stabilize it when hanging off my arm. With the Fig Rig, I just shifted my grip to the top of the ring and held it down low. No bending over, and really smooth shots. What's not to like? Not much, really. The thing is so simple and works so well it's hard to find any downside to it. Ours is equipped with a Bogen quick-release plate adapter, which means that when I order our new tripod in a few weeks (with a Bogen 503 head), I'll be able to slide the camera off the Fig Rig and onto the tripod without changing the plate. They make other adapters, check to see if your tripod head's plate is compatible. They even make an adapter to put the Fig Rig on the tripod. And, now that I've used it, I want to look into getting a shotgun microphone mount, preferably the shock-mounted one. Rarely do I come across a product that is so simple and so useful. It's very affordable so if you're shooting with a small, non-shoulder mount camera, you should get one. Seriously, it actually made shooting more fun today (and everyone comments on it, so you'll feel really cool). Check it out here.